Apparently we're due to get rainfall this week equal to our average annual rainfall -- between 10 and 20 inches depending on how the weather works out. Sounds like the perfect weather to spend some cozy time indoors, scraping old wallpaper and cleaning plaster, doesn't it? I spent some time cleaning this stuff off the walls. I've called it wallpaper paste in the past, though it also fits the description of early indoor paints. Whatever it is, it needs to come off the walls so we can repair the plaster and repaint. As usual, there was a lot of writing on the walls. 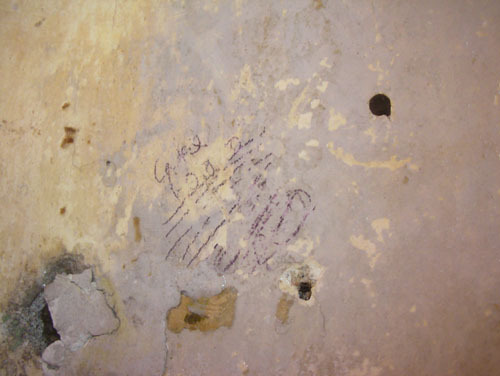 Most of it is clearly working notes from the people who put up the wallpaper in 1899. I'm not sure what this was. Now it's gone; it came right off with the grey stuff when I scraped it. I'm sparing you the before and after photos of the grey walls turning yellowish. They're kind of subtle and not very interesting. 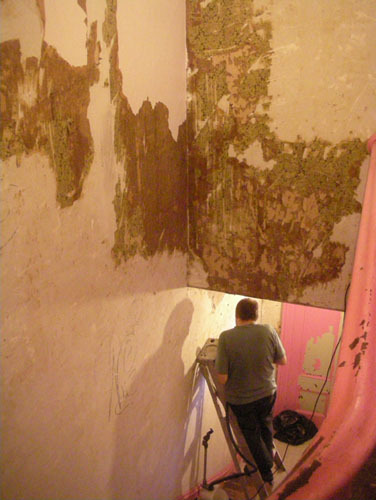 Noel had his own bit of madness today: he attacked the last remaining bit of wallpaper in the stairwell. We'd been avoiding it because it was just out of easy reach from below and above, but with the helpful addition of a little stair block to help hold the ladder steady, he was able to reach all parts of the stairwell. And a few hours later, we had paperless walls. Not clean walls, mind you; that's still waiting for me to get out of the back hall. But there's no wallpaper on them. w00t! That was a non-trivial task. 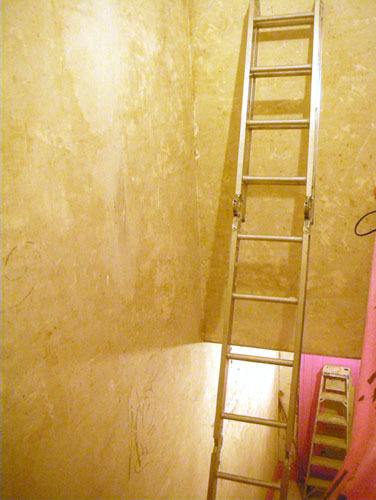 I have a high ceilinged stairway like yours to deal with, and I was thinking I'd have to fork out for one of those ladders with adjustable unequal sides. I had never heard of a stair block. I can't see in the photo how this works, and the web is not illuminating. Does it sit on a lower step and raise it to the height of an upper step, so the ladder has a level base? Karen Anne, yes, that's basically it. It took about ten seconds to build from some scraps we had lying around. I'll take a photo of the block in action and post it for clarification. I used a pole attachment to reach our stairwell. I believe that I attached the scraper and whatever tools I needed to the telescoping painting pole with duct tape- or maybe it was the tape you use for painting. Our ceilings are very short, so I guess it might not have worked if I had a lot of area to cover.